To upgrade your subscription, please contact our sales team at +1-800-815-9959 (United States). If you are outside the United States, you can find the phone number for your country in the footer of the website, call your local sales rep (if you already are in contact with them), or mail us at [email protected]. Ask about upgrading your plan, buying more limits, or a custom plan to fit your needs. You can find your plan’s current summary on the Subscription Info page. From there, click the Upgrade button (1) to go to the Prices page to check out our other subscriptions, request a custom plan, or learn more about our Enterprise Plan. 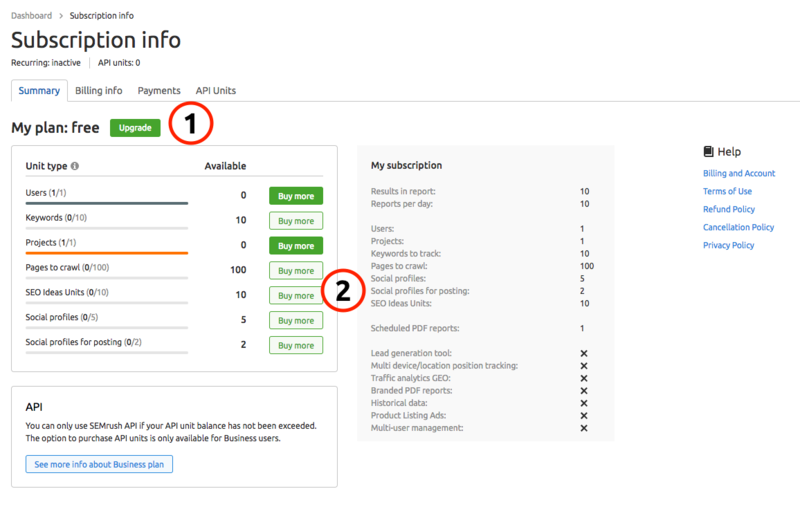 Buy more limits with any of the “Buy more” buttons (2) which will tell your Account Manager to get in touch with you via email. If you need to buy additional limits more urgently, please call your Account Manager directly and they will be happy to help you over the phone. To downgrade your account, contact our support by sending a request to [email protected] There are no restrictions on the number of downgrades, but you might lose your existing Projects. Please note that we keep your Projects data for 30 days after downgrading in case you choose to re-upgrade to recover your data. To cancel your account, you need to send an email request to [email protected] and our Customer Success team will process your request.